This Sunday 13th July will see the third and final Cancer Sell Graffiti Walking Tour. 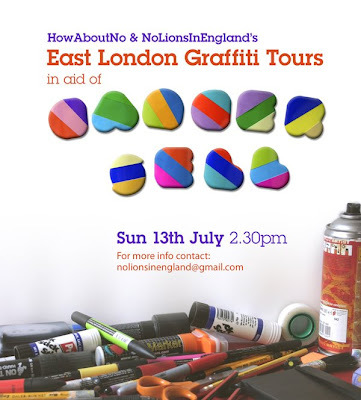 HowAboutNo and NoLionsInEngland will be organising a walking Graffiti Tour around the streets of East London for the Cancer Sell Charity, taking in Shoreditch, Old Street and the Brick Lane areas. The tour kicks off on Sunday at 2.30. Each tour starts from Old Street Tube station, Exit 1. The event costs £5 and 100% of that goes to Cancer Sell.